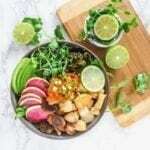 Packed with protein, fibre, anti-inflammatory compounds and plenty of veggies, these Miso Ginger Cod Power Bowls are a perfect meal for balancing blood sugar and satisfying a growling tummy. Whisk together the miso ginger marinade for the fish (first 4 ingredients) in a small bowl, then pour it into a resealable bag or container along with the fish cubes. Let the fish marinate for at least 1 hour. While the fish marinates, make the seaweed salad by soaking the kombu, kelp and arame in warm water for about 5 minutes. Once soft, drain off the warm water and toss in sesame oil, rice vinegar and sesame seeds. Set aside. Prepare the vegetables as indicated above. When ready to cook the fish, heat the oil in a wok for 1 minute. Pour the entire contents of the bag into the wok and stir fry the cubes until opaque, about 3 minutes. Set aside and keep warm. Without cleaning the wok, stir fry the boy choy and mushrooms until just wilted, about 2 minutes. Arrange all of the vegetables in a bowl, followed by the seaweed salad, cod and kimchi. Garnish as desired and serve with lime wedges for squeezing over top before eating. This recipe works really well with previously-frozen cod fillets as they can be easily sliced and cubed. Just be sure that the cod is completely thawed before cooking.